Compact executive contenders | What Car? At this end of the compact executive spectrum, its all about the numbers. Thats why the 316d takes the plaudits the numbers are small in all the right places, but big enough where it counts. With 114bhp and 192lb ft of torque, the 2.0-litre turbodiesel engine has enough shove to pull you around with decent urgency. However, the CO2 output of 118g/km means company car drivers pay tax on just 13% of the cars value, and with the reasonable list price your monthly bills are lower than they would be on any rival. Whats more, the average fuel economy of 62.8mpg will thrill private buyers and company car drivers alike. However you come by your 316d, youll love driving it. The ride is firm but never uncomfortable, while the handling is superb and the steering is quick and packed with feel. Youll enjoy being in the 3 Series, too. The materials are a match for any cars in the class, the cabin is roomy, and although the boot is a strange shape, its a good size. All this and minimal running costs whats not to like? This price point is where the competition really hots up for the 3 Series, because it includes the cream of the Audi A4 and Mercedes C-Class ranges. However, the 320d has previously beaten these rivals into a cocked hat, so they werent really a threat. The new Volvo S60 was, however. Sleek looks and a roomy, swanky interior meant things looked good to begin with, but we quickly found that the new Volvo couldnt match the 3 Series on driver appeal, performance, refinement or cost of ownership. In fact, the biggest threat to the 320d ES came from within its own ranks, in the form of the 320d Efficient Dynamics. The 161bhp output is combined with fuel economy of 68.9mpg and CO2 emissions of just 109g/km, so its even cheaper to run than the 181bhp 320d. 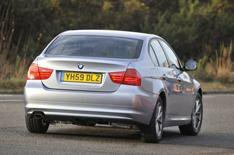 However, we felt the Efficient Dynamics was too hampered by its long gearing, and that the standard 320d is clean and affordable enough for most. Whats more, the punch helps you make the most of that fantastic chassis. For us its the 320d ES all the way. Notice a pattern emerging here? Yep, even when your budget is the size of Bill Gates bank balance, the best compact executive to go for is a BMW 3 Series. The 330d has a six-cylinder, 3.0-litre turbodiesel engine that puts out a whopping 242bhp, plus an even more devastating 384lb ft of torque. Thats enough to hurl you towards the horizon with every prod of the accelerator, and the engine is as smooth as it is powerful. You could go for an Audi A4 3.0 TDI, which has enough straight-line speed to worry the BMW. UK roads have a tendency to throw a bend or two into the mix, though, and here the Audi doesnt do as much to put a smile on your face as the BMW. Its a similar story with the Mercedes C350 CDI. It isnt short of pace or refinement, and the ride is superb, but it doesnt handle or steer as well as the BMW. While the BMW comprehensively outdrives every single one of its rivals, it does so while emitting less CO2 and using less fuel than any of them, so its also cheaper to run. Thats why its a winner. Judging these awards is a painstaking business. We assess every aspect of every car, we crunch every number, and then we argue for hours about which cars should emerge victorious. Things are a little different with the compact executive class. The assessment is still fastidiously thorough and all the sums are still done but when it comes to decision time, theres very little argument. Whichever area you consider space, practicality, quality, safety, value for money the 3 Series has it absolutely nailed. For me, though, its the way the 3 Series makes you feel that really sets it apart. I love the strong engines, precise handling and pin-sharp steering, and especially the way the firm ride gives you a feeling of connection with the road.